A few days after a since-deleted Tweet gave us a sneak peek at Ohio State's new basketball court, we now get our first official look at the new hardwood along with some behind-the-scenes footage of how it all game together. For comparison's sake, here is a video showing what the court looked like previously along with the new court. 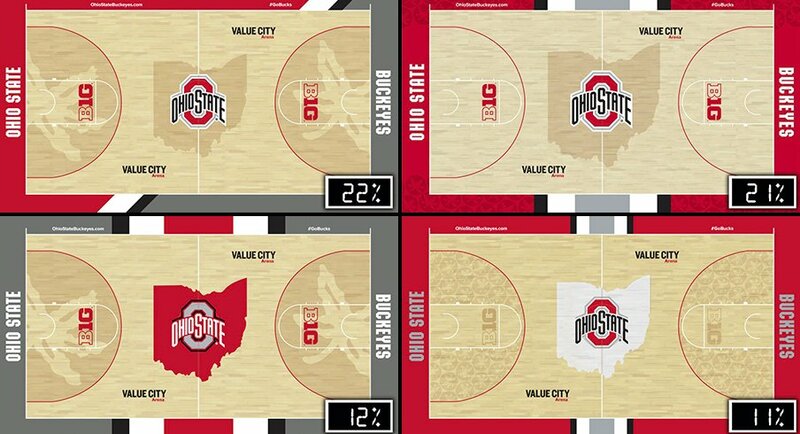 Ohio State sought fan input on the new floor layout, posting 10 initial court designs on social media for a fan vote. The list was then trimmed to four in April, but ultimately the court is not exactly the same as any of those four finalists, shown below, but rather a combination of elements from a number of them. The Buckeyes begin their season with a Nov. 7 matchup with Cincinnati and will play their first official game on the new court on Sunday, Nov. 11 against IPFW.